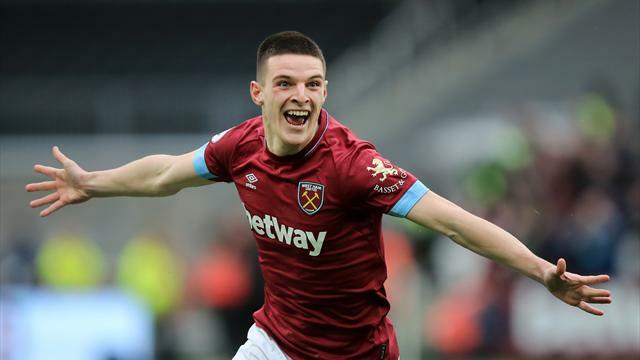 Declan Rice's first goal in the Premier League secured West Ham a memorable victory over Arsenal at the London Stadium. Former Arsenal man Samir Nasri, making his first appearance in the Premier League since 2016, set up the teenage midfielder to wallop home the winner from just inside the box on 48 minutes as West Ham fans celebrated a famous win over their London rivals. The Hammers were the better side throughout and Unai Emery's side could not have complained if the hosts led at the break. Felipe Anderson sent a shot crashing inches wide midway through the half, while Rice glanced wide from just six yards. But the 19-year-old made amends with a lovely strike three minutes after the restart, and though Arsenal - who left out German playmaker Mesut Ozil - had two goals ruled out for offside, while Pierre-Emerick Aubameyang blew a great opportunity, they weren't deserving of any points on the day. The feel-good factor for the hosts, playing in front of a record home crowd, was slightly hampered by want-away striker Marko Arnautovic, however, as the Austrian appeared to wave goodbye when he was replaced by Andy Carroll. A move to China during the January transfer window now looks inevitable for the 29-year-old. West Ham move up to eighth spot in the standings while Arsenal remain fifth in the table, and fail to join Chelsea in fourth spot on points. Emery's side have now gone five games since their last away league victory, going all the way back to their 2-1 victory at Bournemouth on November 25. Since then they have picked up just two points on their travels, conceding an eye-watering 13 goals in the process. It is certainly not the form of a club aspiring for a top-four finish, but with league games with Chelsea and Man City on the horizon, sandwiched by an FA Cup clash with Manchester United, they will need to quickly find a way to get their confidence back. Arguably the Hammers' best player this season, but undoubtedly their standout man on the day. Pellegrini has placed incredible trust in the 19-year-old this season and he's reaping the rewards. Outstanding in defence, making several important interceptions, Rice has also been working on his finishing and he capped another wonderful performance with the match-winning goal. He's quickly emerging as the complete player. 32' - SO CLOSE! Arnautovic looks marginally offside as he receives the ball, but the flag stays down. Nasri takes over and tees up the on-rushing Anderson for a shot. He connects sweetly with a first-time effort that swerves inches wide of Leno's far post. It's the closest we have come to an opening goal so far. 35' - THAT'S NOT FAR AWAY! In fact, the Arsenal supporters - seated at the opposite end of the pitch - think it has gone in! Guendouzi really catches a hold of a venomous shot from 25 yards, it's swerving and dipping, Fabianski is beaten, but it's inches wide of the target. 45' - RICE SHOULD SCORE! Anderson delivers a beautiful corner delivery, picking out Rice who somehow glances his header wide from six yards out! What an opportunity for the youngster to grab his first league goal. 48' - GOAL! West Ham 1-0 Arsenal: RICE! He spurned a golden opportunity just before half-time but the 19-year-old finally has his first league goal to put West Ham ahead! Xhaka fails to clear the corner deliver convincingly, the hosts worked it back into the box, Nasri tees it up to Rice and does the rest, smashing the ball into the top corner with a lovely strike. 65' - AUBAMEYANG SHOULD SCORE! Kolasinac squares the ball for Aubameyang who looks suspiciously offside. The flag stays down but the Arsenal forward can't capitalise, firing the ball over the bar from point-blank range. Ought to do better there.